Tonight, my son and I went to Cobo Arena to see "Walking with Dinosaurs - The Arena Spectacular". We received the tickets courtesy of the Detroit Science Center from following them on Twitter. My son went up to the front desk at the Detroit Science Center and said the word "Roar" (the secret password) and they gave us the tickets. Could it get any simpler than that? Thank you Detroit Science Center! The show chronicles the different historical periods of dinosaurs and the narrator was on stage walking among the dinosaurs as he told their story - and at times even interacting with them. From having a person on stage, we in the audience could see just how huge most of these creatures were and how much work must have went into the construction and animation. The 90 minute show was amazing to see! My son was forever saying "Mom, Look at That", "Mom Wow! ", "Mom, This is Cool!". We were sitting in the middle of the arena and had great seats, but I think the closer seats had the best experience overall. The dinosaurs would come the edge where people were sitting and roar at them. It was fabulous! Photos and video really cannot capture even part of this visual experience. You really have to see it for yourself. It is a once in a lifetime experience for sure! Isn't it Cool! 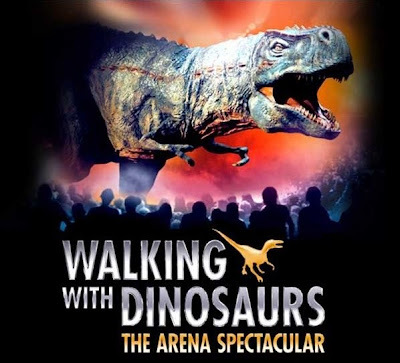 "Walking with Dinosaurs - The Arena Spectacular" is at Cobo Arena through Sunday, January 3, 2010. Wii wish you a Merry Christmas! So on Christmas morning, I am sleeping as people should be at 3:30am when I hear my son's first footsteps creeping in the hallway. Next I hear the toilet flushing at 4:30am and then the child has the nerve to burst into my bedroom at 5:30am calling out "Merry Christmas"! I told him to take his behind right back to bed. At 6:45am, knowing he could not take it anymore, I allowed him to go for the gusto. I hear running, yelling, screaming, and jumping - Tell me, how one gift of a Wii can cause such a rush of total happiness for a child? Since it is that most wonderful time of the year, it means it is time for my son to visit Santa. So I decided to make it a real fun day by visiting with Santa at the GM Ren Cen, taking the free GM Ren Cen tour, and riding the People Mover. When we entered the Ren Cen, we went straight to the GM car exhibit where Santa's Winter Toy Land was setup. Photos with Santa are FREE at the Ren Cen and each child gets their photo in a frame with a candy cane. We decided to do something a little different this year (as you can see from the photo above) and take our picture with Santa wearing cool shades. Santa was all for it, asking me why I did not bring him some shades to wear too! My son started rolling off his Christmas list which included a Wii and Wii games. As he started to continue with his list, Santa cut him off to say that the Wii and games would be enough due to the cost. 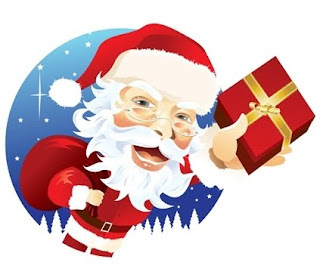 I love Santa! After Santa, we went over to the Ren Cen Wintergarden to start our free tour. The Renaissance Center became the tallest building in Detroit when it opened in 1977. The Ren Cen is larger than Rockerfeller Center in New York - bet you did not know that. GM bought the building in 2004 and put 500 million dollars in renovations into the building including the Wintergarden, the 50,000 lbs Borealis Glass Art Sculptures in the front lobby, and the floating glass walkways that you see in the photos above. The highlight of our tour was riding the private glass elevator 72 stories to the top of the Ren Cen to the elegant Coach Insignia Restaurant. Unless you are having dinner at the restaurant, the tour is the only way to ride the glass elevator. The views of Canada, Belle Isle, Downriver, and downtown Detroit were wonderful. We could also see the Detroit Princess boat which I found out is still doing dinner cruises even in the Winter. After our Ren Cen tour, we went to the Ren Cen People Mover Station to catch the train. The People Mover opened in 1987 and runs on a 3 mile elevated track with stops at the Ren Cen, Grand Circus Park, Broadway, Cadillac, Greektown, the Millender Center, the Financial District, Joe Louis Arena, Cobo Center, Fort/Cass, and Michigan Ave. Each People Mover Station has custom artwork that reflects the area where the station is located. Since it was a clear day, we had great views of Downtown Detroit, Canada and the Detroit River from our train car. Everyone knows that I love contests and I have been winning a lot of contests lately. 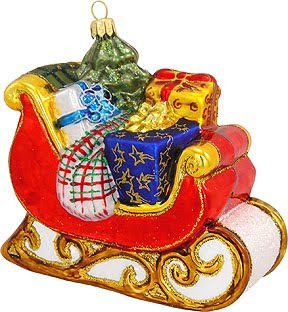 Well my winning streak continues with a great Christmas gift just for me - a Bronner's 3-D Sleigh Glass Ornament hand-crafted in Poland. I won the ornament on the blog Detroit Mommies. And yes, the ornament came from the world famous Bronner's Christmas Wonderland Store in Frankenmuth, MI where it is Christmas all year round. I won it last Thursday and Bronners FebEx'ed it to me and it arrived Saturday after my son's school recital. I love a bargain. I love to save money and to get the best deal when I have to spend money. But I have also learned that keeping all the money that I save is a mistake. When I keep everything for myself, I find that my life is totally out of balance. A balanced life includes both saving and giving. So I make sure that I give a portion of my money and my time to my church and to selected charities. In this holiday season, with so many people in need, giving has become a necessity. So if you have saved any money or time by following FREEISMYLIFE over 2009, I encourage you to give some of it back to help others. If you are interested in giving to a world charity, consider Nothing But Nets, a charity that my son is working with through scouting that is helping to end malaria deaths in Africa by providing insecticide treated bed nets. If you are want to help women and keep your money local, consider The White House Project Project and Sisters Acquiring Financial Empowerment (SAFE). > For the WHITE HOUSE PROJECT Project, the Michigan Women's Forum is trying to raise $1,000 to fund workshops and training that will equip Michigan women with the tools they need to get involved in leadership. > And SAFE is doing the difficult job of equipping survivors of domestic violence with the appropriate financial tools and resources needed to enable these women to leave or recover from the economic portion of domestic violence. If you want to help children, consider The Detroit Area Diaper Bank, a local charity that is providing diapers to families that cannot afford to buy them. If you don't have the money to give right now, consider giving your time by volunteering at a charity or even just volunteering at your child's school when school reconvenes. You can even do something as simple as helping to give FREE mammograms by going to the Breast Cancer site everyday and clicking on their "'donate a mammogram" link. Whatever you do, know that there is nothing too small when it comes to giving. Take it from me, you will feel better and be blessed in ways that you never thought. So, be someone's Santa during this holiday season. Give. 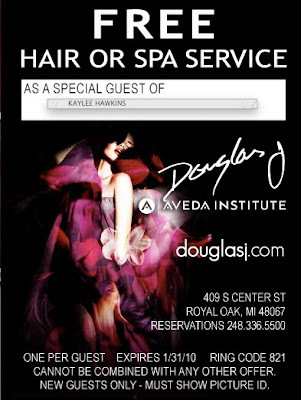 a pass for a FREE Spa or Hair service for NEW CUSTOMERS at the Douglas J Aveda Institute in Royal Oak. The pass expires on 1/31/10 so go book your service today! Click here to print out the pass. One pass per new customer. As a thank you to Kaylee, please follow her on Twitter at @kayleehawkins. This evening, my son and I attended the Detroit Symphony Orchestra's yearly "Home for the Holidays!" concert. I received the tickets courtesy of the DSO. For this "Home for the Holidays!" concert series, the DSO was joined by the local Andover High School Choir and the Grosse Pointe South High School Pointe Singers. These teenage singers were marvelous and sang holiday classics like "O Christmas Tree", "Deck the Halls" and "The First Noel" just beautifully. But then again, what singers would not sound great when they are being backed up by the Detroit Symphony Orchestra! The DSO was also joined by soprano opera talent and native Detroiter Kisma Jordan. Ms. Jordan was wonderful and showed her diverse range from singing the easy listening Christmas favorite "Chestnuts Roasting on a Open Fire" to her powerful rendition of "O Holy Night". This concert series marked the return of former DSO conductor Thomas Wilkins. I love Mr. Wilkins' elegant and personable style. He always interacts with the audience and tells a little history on the music that is being played so that everyone has a greater appreciation of the songs. One of his explanations was for the song "Christmas Eve Waltz" where he informed us that the song was an interpretation of a set of photos showing the solitude of the home on Christmas eve after all the kids have gone to bed and it is now the parents turn to have some fun. What parent can't identify with that? I also loved Mr. Wilkins fun explanation of a series of Hanukkah tunes, calling them "rock and roll dreidel songs". 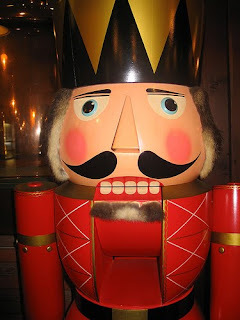 Since it is the Christmas season, the DSO played selections from The Nutcracker. I had just taken my son to the DSO to see The Nutcracker a few weeks ago, but it shocked me when he turned to me and told me that he remembered the music. You never know if things are actually penetrating your kid's brain and I was proud that he is starting to appreciate all kinds of music, including classical. But my son's real appreciation of the night came when Santa made an appearance. My son's eyes lit up and he started chatting Santa's name and everyone around us in the audience got real enjoyment in seeing his excitement! But that excitement was nothing compared to his smile when the Grosse Pointe South Santa Tappers came on stage tap dancing in full Santa costumes to the tune "Santa Claus is Coming to Town". Everyone in the audience was laughing at that unexpected treat, especially when they ended the routine with Rockette chorus line high kicks! This was a wonderful evening and a great concert. My son told me he wants to do it again. Now when a 9 year old has fun, you know it must have been good! Thanks to my new Twitter friend at LA Bargain Hunters, I have a new FREEBIE for you advance screening lovers. Universal Pictures has a Sneak Previews Club and anyone can signup so that Universal Pictures can contact you when they are hosting sneak previews in your area. What a great freebie! 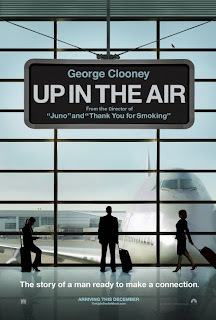 Tonight, I went to see an advance screening of the new movie "Up in the Air" at the Birmingham Uptown Palladium. I received the tickets courtesy of Paramount Pictures. In this movie, George Clooney plays a man who flies all around the country firing people who are being downsized from companies. He is on the road 323 days and is only home for 42 days a year. To shelter himself from the heavy emotions involved in his very difficult job, he has downsized his life to only what he can pack in his carry-on luggage and stays clear of any real human emotional contact, especially from his sisters who he has ignored for years. But his organized, emotionless world is turned upside down when his younger sister gets engaged, he meets a beautiful woman who makes him think about changing his lifestyle, and his company grounds him from flying after he trains a young raising star at his company in how to fire people. George Clooney gives a wonderful performance as a man at a crossroad who decides to take a chance on all the wonderful, messy emotions that come with liking, loving, living, and being disappointed with those people that you care the most about. I really loved this movie because it takes the viewer on an emotional roller coaster. It is both laugh out loud funny and very sad, especially the parts when people are being fired from their jobs. The movie gives a realistic portrayal of how life does not always go your way, but the support of people who love you make the journey worth all the risk. Tonight, I went to the Max at the Detroit Symphony Orchestra for a special performance of "Creole Christmas" by the Preservation Hall Jazz Band. I received the tickets courtesy of the DSO. If I had to sum up the entire evening in one word, it would be "Delightful". I got to the MAX a little early and I was able to catch the tail end of a pre-show performance by the Detroit School of Arts Civic Band which is comprised of teenage students. They were rocking the big band era music and they sounded fantastic! 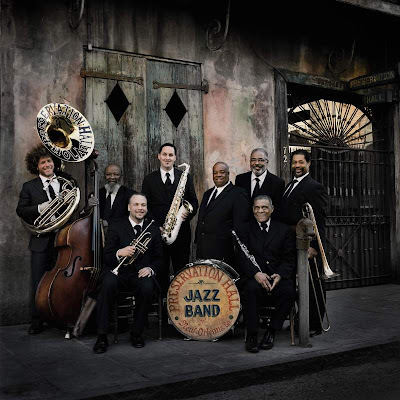 The Preservation Hall Jazz Band is from the Big Easy and their performance made me think of summer, gumbo, relaxing on the water, kicking back with an alcoholic beverage and taking things real easy. They played and sang a blend of old jazz favorites and holiday tunes, all with that New Orleans flavor. From "I Wish I Could Shimmy Like My Sister Kate" to the Christmas song "Bells Will Be Ringing", the Preservation Hall Jazz Band's diverse range of songs just delighted everyone in the audience. During their jazzy New Orleans version of the gospel song "His Eye is On the Sparrow", everyone in the audience was tapping their feet to the music and a man behind me jumped up and started clapping to the music and singing his heart out - I cannot think of the last time I saw someone do that at the DSO!. The evening ended with a New Orleans style funeral march to "Just A Closer Walk With Thee" (including the famed umbrellas) followed by the jazzed up version of the same song played by the band as they exited the stage into the aisles with the entire audience following behind them in a New Orleans style parade. On the way out, people were in such a great mood that they were buying the band's CD " New Orleans Preservation Vol 1" to hold on to the memories of the evening. What a fun night! 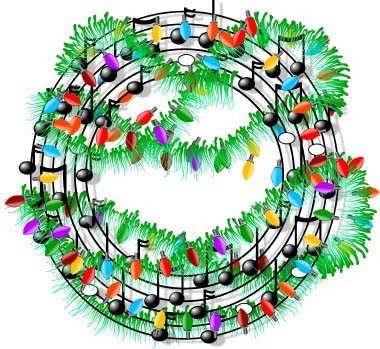 The DSO will continue their fun holiday concerts this weekend with "Home for the Holiday" concerts on Saturday, December 19th and Sunday, December 20th. Breakfast is the one meal that my family never skips because it is the most important way to start your day. So when Pillsbury offered me a FREE sample of their new Pillsbury® Grands!® Flaky Layers Honey Butter Biscuits, I jumped at the chance to try them out. 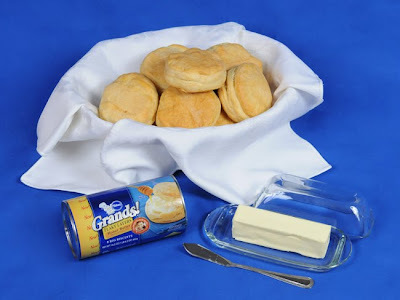 I have always loved Pillsbury Grands Biscuits and these new Flaky Layers Honey Butter Biscuits are delicious, addictive and very filling. I know all of you are probably in your mind's eye seeing the warm biscuits now with all the flaky layers dripping with a little butter and some syrup. Yummy! Where is my napkin? If you would like to try these warm, hearty biscuits for yourself, enter my contest* for a chance to win a Honey Butter Biscuit prize pack which contains coupons for FREE Pillsbury Honey Butter Biscuits along with a glass butter dish and knife. (see photo above) GOOD LUCK! 1. Being a subscriber to my FREEISMYLIFE RSS feed. *Contest ends on 12/18/2009, 11:59pm EST. Winner will be contacted via email on 12/19/2009. * One entry per address. United States residents only. * The winner will be randomly chosen. *Pillsbury has provided the free product, information, and prize pack through MyBlogSparkTM. UPDATE: 12/19 - The winner is...Caitlin W. of Columbus, OH. Contragulations Caitlin!!!! Tonight I went to an advance screening of the movie "Invictus" at the Birmingham Uptown Palladium. I received the tickets courtesy of Warner Bros. Pictures. "Invictus" tells the true story of the events leading up to the 1995 world championship win of the South Africa rugby team. Morgan Freeman plays Nelson Mandela who in 1994 was only a few years into his presidency in South Africa. Mandela is looking for ways to bring and whites and blacks into one united South Africa. White South Africans loved the country's almost all white rugby team while the team represented all things apartheid to Black South Africans. South African had won the right to host the world rugby finals, which meant that not only would all of South Africa be watching the finals but also over a billion people from all over the world. Mandela decides that the South African rugby team has to win the championship! 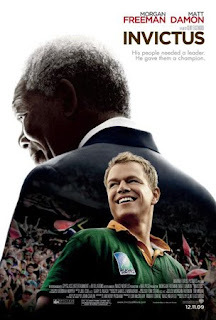 Mandela befriends the caption of the South African rugby team, played by Matt Damon, and encourages him through example to lead his team to greatness even in the face of insurmountable odds. Watching the movie, it is amazing to me how something as simple and basic as sports can break down barriers of hate and unite people who previously felt they had nothing in common. The move was wonderful. The story was remarkable and heart warming. My only problem with the movie was the length - 2 hours and 10 minutes! But I guess that Clint Eastwood, who directed this movie, found it was not easy to tell this type of story in a normal movie length. I was browsing through the Express store on my afternoon off from work, and fell in love with this beautiful sweater cardigan in gray (you know that gray is the new black). It's lightweight, fits greats in a size medium and I love the 3/4 length sleeves which is great for year round wear and showing off my jewelry. The only thing that I did not like was paying the full price of $39.50. So I did what any cheap person would do, I went to the Express website and signed up for their emails and they gave me access to a 15% off coupon. I have already thought out at least 3 new outfits and now I can make them a reality. Even though I don't like spending money, I love fashion. I believe that everyone should look fabulous when they leave home, so my favorite things to buy are clothing and jewelry (but never at full price). I also love reading about fashion. I am currently reading a book called "Fabulous Fakes" by Carole Tanenbaum. I have been following the fashions of First Lady Michelle Obama since she was on the campaign trail and Carole Tanenbaum's line of jewelry has been worn by the First Lady on many occasions. Two of Carole's pieces now made famous by Mrs. Obama is the brooch from her inauguration outfit and the orange brooch worn when Mrs. Obama was greeting military families at Norfolk naval base. The book takes a look at costume jewelry made from the middle 1800's to current day. There are beautiful color illustrations and historical references that tell how the state of the economy influenced the type of jewelry people wore and the materials from which the jewelry was made. It used to be that I would wear very small jewelry that only I could see. Now, as I am growing older and bolder, I am buying and wearing medium to large colorful jewelry pieces. I am also preferring costume jewelry to the real thing because it makes a bigger statement and is usually far cheaper that the real thing. I am really loving some of First Lady Michelle Obama's vintage inspired pieces that she is sporting. I guess that I am getting sassy in my old age. 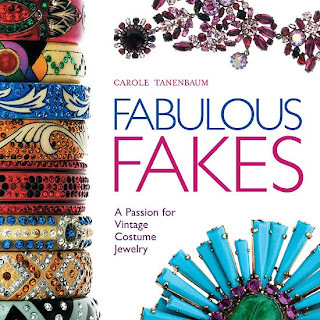 After all, everyone should be fabulous just like the jewelry in Ms. Tanenbaum's "Fabulous Fakes". This morning, I and my son went to see a performance of "The Nutcracker" at the Ford Theater for the Performing Arts adjacent to the DSO. The 11am show was a Tiny Tots abridged version of the performance meaning that the show only lasted 1 1/2 hours instead of 2 hours. I choose the Tiny Tots performance to make sure that my 9 year old would not become antsy, but the show was so good that there was not a chance of that happening. 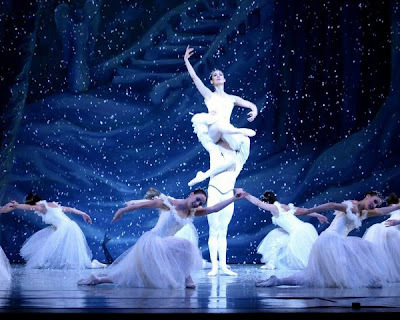 The music for "The Nutcracker" was provided not by the regular Detroit Symphony Orchestra, but by the Detroit Symphony Civic Orchestra where the average age of the players is 16 years old. The kids were fantastic! If I had not been sitting in the first row and able to see them as they were playing, I would never have known that they were teenagers and not the regular Detroit Symphony Orchestra. All the children in the audience were fascinated by the Civic Orchestra and came right up to the orchestra pit to watch them practice before the show and during intermission. The average age of the kids in the audience was about 6 years old and they provided a wonderful flavor to the performance. The children in the audience were told at the beginning of the show that they were not in church and they did not have to stay in there seats during the performance. And by the second half of the show, the kids were in the aisles trying to imitate the wonderful dancing that they were seeing on stage from members of the local city of Taylor Ballet Americana. Besides the traditional ballet, there were also cossack dance numbers where the dancers did tumbling, back flips, and front flips. My son loved the back flips and tumbling and he applauded the loudest in the audience for those dances. The show was a huge success and something that I know none of the adults and children in the audience will forget. Walgreens has a new line of custom photo shirts designed just for Moms. The shirts allow for a photo of your child to be added to a beautifully designed logo applauding your role as a sports mom. The sports logos include Swim Mom, Soccer Mom, Baseball Mom, and Volleyball Mom. They also sell Palm Tree and Floral designs without the sports theme. 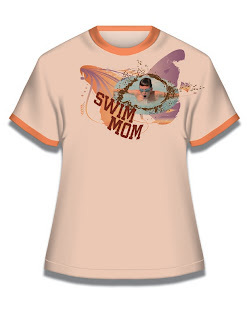 My custom Swim Mom shirt arrived yesterday courtesy of Liberty Photo. I was worried at first that the shirt might have a boxy, manly fit, which I cannot stand. But these shirts are made just for women with beautiful logo designs and a flattering shape that hugs the female curves. (Love that!) And the light coral color of the shirt is extremely flattering to all skin colors.